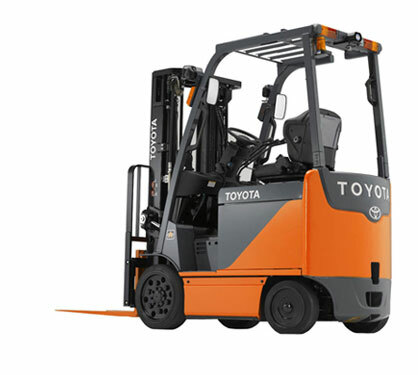 Once again, Toyota ingenuity and design have come together to create the revolutionary 8-Series 4-wheel electric forklift with the AC (Alternating Current) drive system. Yet the AC drive motor isn't the only milestone component driving these products. Toyota's exclusive System of Active StabilityTM (SAS) shares the spotlight. These two industry-leading technologies combine to elevate operator productivity and workplace safety to unprecedented levels. Check out some of the features below to learn more about these great trucks, and don't forget to visit your authorized Toyota Industrial Equipment dealer to get a demonstration! Curvilinear overhead guard legs provide a wider opening for operator entry/exit. Electric shift lever offers easily accessible fingertip control for fast and easy directional changes. Automotive style light switch and turn signal levers are integrated into the slim profile steer column for easy accessibility and simple operation. 12-inch-long dual operator assist grips have been designed to meet the needs of varying operator sizes and are in line with the overhead guard pillars for improved operator peripheral vision. Low profile front cowl results in enhanced forward visibility and lessens back strain by reducing the need for the operator to lean forward to view load and fork tips. Foot-activated parking brake further lessens operator back strain by reducing the need to lean forward to activate and disengage parking brake. Foot brake location also eliminates clutter from cowl area, enhancing forward visibility. Overly spacious legroom provides unsurpassed comfort levels throughout the operator's work shift. Heavy-duty, non-slip floor mat adds to this comfort by minimizing noise, heat and vibration. EZ Pedal option allows operators to quickly and easily change travel direction without removing a hand from the steering wheel or hydraulic controls. Mini-lever or joystick hydraulic controls with Ergo-Shift feature a three-way adjustable armrest to enhance operator comfort and productivity. High mount key switch and parking brake release lever have been strategically placed to minimize the need for an operator to lean forward in the seat. Cowl-mounted hydraulic levers are ergonomically situated for improved operator comfort and unobstructed entry/exit from the right side of the truck. On-demand, full hydrostatic power steering is controlled through the AC hydraulic motor system, eliminating an additional motor to service. No-tool floorboard lifts out in seconds for fast, easy access during daily operator checks. Fault code memory with hour meter reading displays forklift history to simplify troubleshooting. Battery roll- and slide-out options with redesigned battery retaining system are available for easy battery replacement. Curved front fenders with redesigned tie-down hooks offer improved security while shipping the unit. Analyzer Mode displays the status of the electrical system and allows instantaneous access to information on errors detected by the controller. Self-diagnostics with built-in analyzer capabilities are offered through the optional multifunction digital display, eliminating the need for a hand-held analyzer. Planned maintenance hour meter notifies operators of the need for routine maintenance and service via the digital display monitor. The service intervals are programmable. Right-side panel provides reliable protection and easy service access to the hydraulic motor. On-demand, full hydrostatic power steering offers low-effort control while providing precise maneuverability and load handling in confined work areas. Programmable performance parameters may be customized through the digital display to adjust to a variety of job applications and operator skill levels. Momentary hold and controlled descent feature maximizes forklift control when the accelerator pedal is released on a grade by regulating rolling speed. Touch-pad, keyless entry system with password protection option allows only designated personnel to operate the equipment. Tuning mode is used to make fine adjustments in the traveling and material handling features in order to customize the performance parameters for individual operators and varying applications. Power keep function allows the 8-Series' AC motors continue to perform at productive levels even when the battery charge is low. Multifunction digital display with illuminated icons informs the operator of vital operating information for maximum uptime. Performance parameters may be customized through the digital display to adjust to a variety of job applications and operator skill levels. Pre-set performance parameters (S.P.H.) are available for simpler truck performance customization. Multifunction hour meters allow for planned maintenance scheduling and the ability to perform time and motion studies. Programmable battery discharge indicator enables customization of the truck's battery discharge settings to closer match the battery's discharge rate, helping to maintain proper battery life. Battery discharge indicator with lift interrupt prolongs battery life. Auto-Off System is seat-activated and programmable to conserve battery power. Power select indicator displays the mode currently in operation by highlighting either S (savings), P (performance) or H (high performance). Auto height select option allows operators to program the forklift to automatically stop the forks at pre-determined rack heights to maximize productivity. Available on 4-Wheel AC electric 4,000 and 5,000 lb. models. Suited for customers that have narrow aisles. Benefits customers that demand shorter, more compact forklifts to increase their productivity. Warehouse and Distribution Centers, Food Distribution and Food Manufacturing are industries that will benefit from this option.